FCQC is Going to Market! We won't rest at FCQC until we bring our customers new and fun projects, notions, ideas, patterns . . . That's why this Newsletter is being brought to you from the air, where Judy is traveling to Quilt Market in Houston. Upon her return, we will schedule a fun evening event to show you what is coming into the shop. Those who attend will get to sign up early to be the first for new . . . well, everything! Stay tuned for more information. Join us on Halloween . . . If you Dare!!!!! Open sewing and deals so great they are scary! 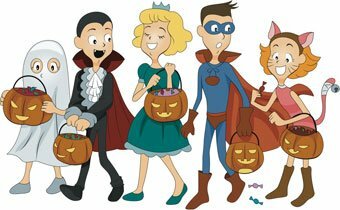 Come in costume and get 10% off your ENTIRE purchase (excluding trunk show) and get your loyalty points, too! Snacks all day long, scary movies playing on the big screen and lots of fun sure to make you howl! Best costume receives and additional prize. Don't miss out on the fun. So many new projects for those who are on your Good list. Our Holiday Open House on November 4th will run from 9:00 a.m. to 3:00 p.m. While you are in the shop, fill out a holiday "Wish List" and we will keep it on file for you. Send in those who say to you, "I don't know what to get you" and we will give them your wishlist! 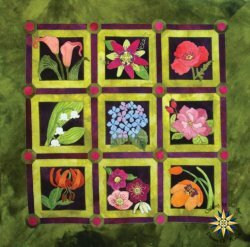 Also, don't forget the Quilt Show going on in our classroom showing works from award winning Japanese quilter, Rie Grimm. She just keeps winning award after award for her amazing handwork. Only one word can describe her work . . . AMAZING! Did you know that you can shop online? Just go to our website and you can shop in your jammies! We ship within a day, or you can pick up in store. Sew easy! This beauty is available next week! 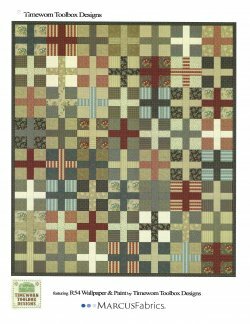 Seven months and only $14.95 per month includes all fabrics shown here plus pattern. This one is sure gorgeous! You'll want to sign up for this beauty ASAP! $57.95 for 11 months. Thread kit available separately. This price includes all wool for top, binding AND backing. Finishes 42 x 42. Out of town? Don't worry. We will ship this one for free. Call the shop and we will sign you up. Before another newsletter goes by, Judy and Tim would like to take a brief moment to acknowledge and thank the incredible staff at FCQC. All of those who work there are talented, kind and incredible women. We have had such a great beginning because of Betty, Mary, Marge, Lori and Jenn and we realize that it is in large part because of them. Our staff is awesome! You should come in and meet them. Th: 9:30 a.m. - 7:00 p.m.S: 9:00 a.m. - 3:00 p.m.
Sun: 11 a.m. - 2:00 p.m.